Two all-wheel drive variants of Tesla’s Model 3, including a normal model and a performance model, are set to open for orders next month with deliveries beginning in July, according to CEO and product architect Elon Musk. Last night in a series of Tweets, Musk released information on the two new Model 3 dual motor models, including performance, pricing, a new service module, and a few new options. The news comes as little surprise, given he has been teasing the AWD model for months, claiming a July release. The standard mid-size fastback sedan Model 3 features a single electric motor powering just the rear wheels with 258 horsepower and 317 ft-lb of torque. The new dual motor version will add a second electric motor to the front axle, adding forward propulsion power and all-wheel drive grip. Though we don’t yet know the model’s total system horsepower, the extra motor reduces the Model 3’s 0-60 time from 5.6 seconds in the standard rear-driven variant down to 4.5 seconds for the standard dual motor, and a 3.5 second sprint for the Dual Motor Performance. The Performance iteration will allegedly cost customers $78,000, and will come fully loaded with all of the options, bar one. Tesla’s so-called Autopilot will not come standard, and will be an additional cost option. Musk compares the price to a BMW M3, but says the Model 3 Dual Motor Performance is 15 percent quicker and will offer superior handling. “Will beat anything in its class on the track,” he also claims. The Performance is limited to 155 mph. 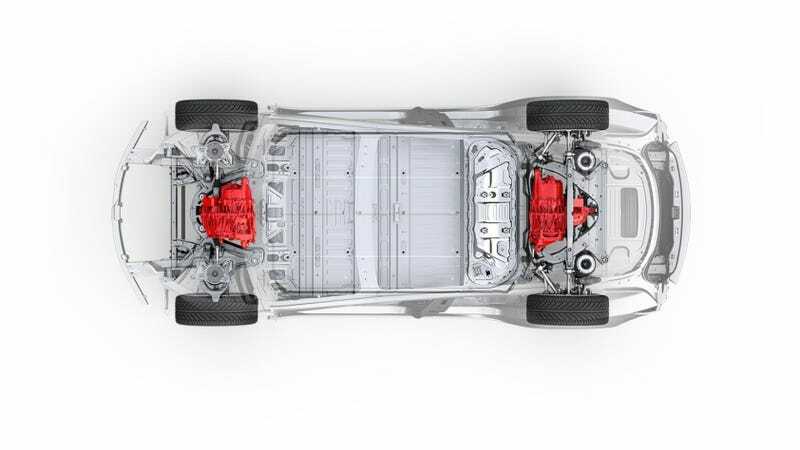 The “normal” dual motor Tesla Model 3 adds an extra pair of driven wheels, but is optimized for range and economy rather than outright performance. The AWD option will add $5,000 to the price of a standard Model 3. Without that extra power, this example will be top-speed limited to 140 mph. While the claimed range of both the Performance and the Normal dual motor models remains at 310 miles, the same as the extended battery rear-drive model, it seems unlikely you’ll reach that if you’re dipping into the throttle with zeal. In addition to the dual motor models, Musk seems quite proud to be able to offer white interiors. Finally!